PLEASE NOTE: SCOOTERS ARE CURRENTLY UNAVAILABLE. Please add your name and email to be updated when new scooters become available. 1) Not recommended for use with a foot cast (the cast weight may pull you to one side, and you will not have traction when your foot touches the ground). and attaching seat to the seat post. 3) INSURANCE: We do not submit insurance claims for customers. Some insurance companies may cover all or part of the cost of a scooter. We have been told that Medicaid will not cover crutch alternatives. Medicare may cover a scooter, but you should contact them with both the HCPCs code for crutch alternatives (HCPCs E0118) and the CPT code, or procedure code, that your doctor uses to describe your condition. SHIPPING: If you live in Alaska or Hawaii or elsewhere, please contact us with your address to get a shipping quote. We also offer expedited shipping at additional cost. 1. Please notify us that you would like to return your product within fifteen days of the scooter purchase. 2. Product must be in new condition. 3. Product must be returned in its original packaging. 4. Once we receive your product back, we will issue you a refund, less the shipping cost, within one week. Refunds are given in the transaction method the scooter was purchased with. For example, if you used PayPal to purchase your scooter, your refund will be issued through PayPal. 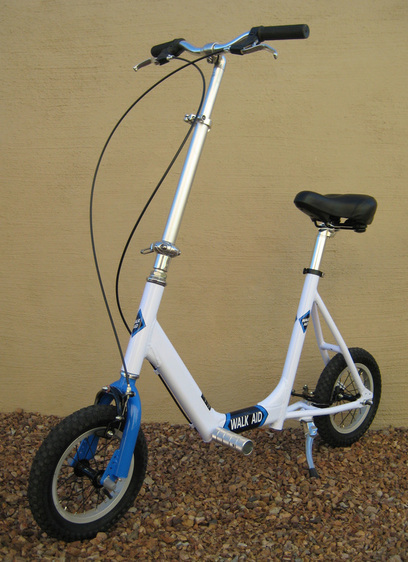 The scooter has a one-year Limited Warranty to the original owner against manufacturer defects. Please see the owner's manual for detailed product warranty information. Abuse or mis-use of the scooter voids the limited warranty.